Skin cancer can occur anywhere on the body, but it is most common in skin that is often exposed to sunlight, such as the face, neck, hands, and arms. The most common types are basal cell carcinoma and squamous cell carcinoma, which are nonmelanoma skin cancers. Nonmelanoma skin cancers rarely spread to other parts of the body. Melanoma is a much rarer type of skin cancer. It is more likely to invade nearby tissues and spread to other parts of the body. Actinic keratosis is a skin condition that sometimes becomes squamous cell carcinoma. Having certain changes in the genes that are linked to skin cancer. Nonmelanoma skin cancer and actinic keratosis often appear as a change in the skin. Not all changes in the skin are a sign of nonmelanoma skin cancer or actinic keratosis. Check with your doctor if you notice any changes in your skin. Raised, and red or reddish-brown. A rough, red, pink, or brown, raised, scaly patch on the skin that may be flat or raised. 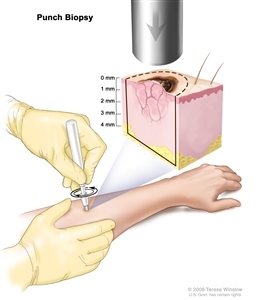 Tests or procedures that examine the skin are used to detect (find) and diagnose nonmelanoma skin cancer and actinic keratosis. The prognosis (chance of recovery) depends mostly on the stage of the cancer and the type of treatment used to remove the cancer. The stage of the cancer (whether it has spread deeper into the skin or to other places in the body). 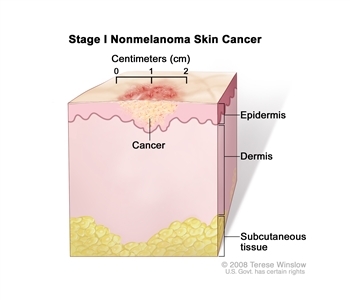 After nonmelanoma skin cancer has been diagnosed, tests are done to find out if cancer cells have spread within the skin or to other parts of the body. The process used to find out if cancer has spread within the skin or to other parts of the body is called staging. The information gathered from the staging process determines the stage of the disease. It is important to know the stage in order to plan treatment. Lymph node biopsy: For squamous cell carcinoma, the lymph nodes may be removed and checked to see if cancer has spread to them. 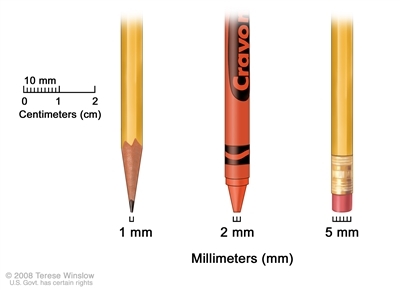 The tumor is thicker than 2 millimeters. 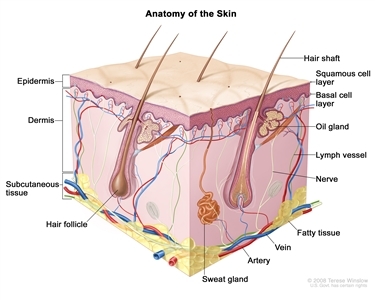 The tumor is described as Clark level IV (has spread into the lower layer of the dermis) or Clark level V (has spread into the layer of fat below the skin). The tumor has grown and spread along nerve pathways. The tumor began on an ear or on a lip that has hair on it. The tumor has cells that look very different from normal cells under a microscope. 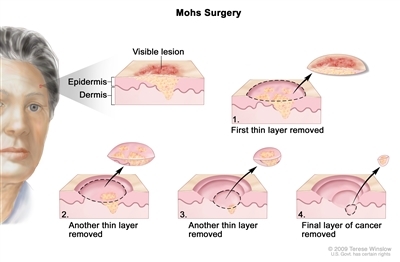 In stage 0, abnormal cells are found in the squamous cell or basal cell layer of the epidermis (topmost layer of the skin). These abnormal cells may become cancer and spread into nearby normal tissue. Stage 0 is also called carcinoma in situ. 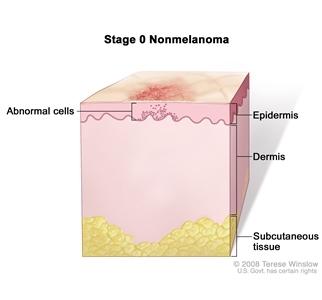 Stage I nonmelanoma skin cancer. The tumor is no more than 2 centimeters. 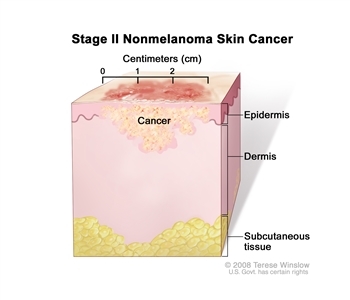 Stage II nonmelanoma skin cancer. The tumor is more than 2 centimeters wide. The tumor has spread to the jaw, eye socket, or side of the skull. Cancer may have spread to one lymph node on the same side of the body as the tumor. The lymph node is not larger than 3 centimeters. 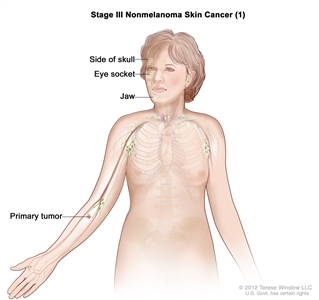 Stage III nonmelanoma skin cancer (1). Cancer has spread from the primary tumor to bones of the jaw, eye socket, or side of the skull. 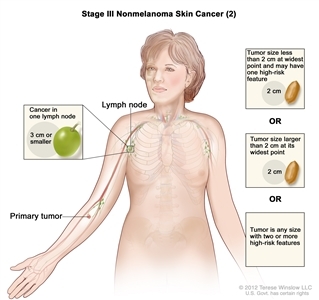 Stage III nonmelanoma skin cancer (2). Cancer has spread to one lymph node that is 3 centimeters or smaller and is on the same side of the body as the primary tumor. Also, the tumor is 2 centimeters or smaller at its widest point and may have one high-risk feature; OR the tumor is larger than 2 centimeters at its widest point; OR the tumor is any size and has two or more high-risk features. There are five high-risk features: (1) the tumor is thicker than 2 millimeters; (2) the tumor has spread into the lower layer of the skin or into the layer of fat below the skin; (3) the tumor has grown and spread along nerve pathways; (4) the tumor began on an ear or on a lip that has hair on it; and (5) the tumor has cells that look very different from normal cells under a microscope. 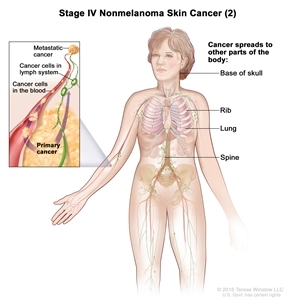 Stage IV nonmelanoma skin cancer (1). The tumor is any size. 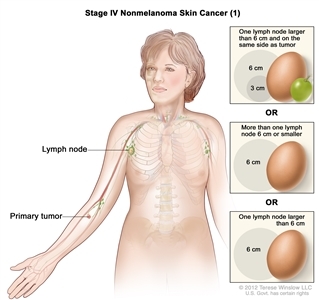 Cancer has spread to one lymph node that is larger than 3 centimeters but not larger than 6 centimeters and is on the same side of the body as the tumor; OR to more than one lymph node 6 centimeters or smaller on one or both sides of the body; OR to one lymph node that is larger than 6 centimeters. Stage IV nonmelanoma skin cancer (2). The tumor is any size and has spread to the base of the skull, spine, ribs, lung, or other parts of the body. Stage I is divided into stages IA, IB, and IC. Stage IB: The tumor is larger than 5 millimeters but not larger than 10 millimeters or has spread to the connective tissue of the eyelid, or to the edge of the eyelid where the lashes are. Basal cell carcinoma is the most common type of skin cancer. It usually occurs on areas of the skin that have been in the sun, most often the nose. Often this cancer appears as a raised bump that looks smooth and pearly. Another type looks like a scar and is flat and firm and may be white, yellow, or waxy. Basal cell carcinoma may spread to tissues around the cancer, but it usually does not spread to other parts of the body. Actinic keratosis is a skin condition that is not cancer, but sometimes changes into squamous cell carcinoma. It usually occurs in areas that have been exposed to the sun, such as the face, the back of the hands, and the lower lip. It looks like rough, red, pink, or brown scaly patches on the skin that may be flat or raised, or the lower lip cracks and peels and is not helped by lip balm or petroleum jelly. There are different types of treatment for patients with nonmelanoma skin cancer and actinic keratosis. Different types of treatment are available for patients with nonmelanoma skin cancer and actinic keratosis. Some treatments are standard (the currently used treatment), and some are being tested in clinical trials. A treatment clinical trial is a research study meant to help improve current treatments or obtain information on new treatments for patients with cancer. When clinical trials show that a new treatment is better than the standard treatment, the new treatment may become the standard treatment. Patients may want to think about taking part in a clinical trial. Some clinical trials are open only to patients who have not started treatment. The way the radiation therapy is given depends on the type of cancer being treated. External radiation therapy is used to treat skin cancer. Chemotherapy is a cancer treatment that uses drugs to stop the growth of cancer cells, either by killing the cells or by stopping them from dividing. When chemotherapy is taken by mouth or injected into a vein or muscle, the drugs enter the bloodstream and can reach cancer cells throughout the body (systemic chemotherapy). When chemotherapy is placed directly into the cerebrospinal fluid, an organ, or a body cavity such as the abdomen, the drugs mainly affect cancer cells in those areas (regional chemotherapy). Chemotherapy for nonmelanoma skin cancer and actinic keratosis is usually topical (applied to the skin in a cream or lotion). The way the chemotherapy is given depends on the condition being treated. Retinoids (drugs related to vitamin A) are sometimes used to treat squamous cell carcinoma of the skin. Photodynamic therapy (PDT) is a cancer treatment that uses a drug and a certain type of laser light to kill cancer cells. A drug that is not active until it is exposed to light is injected into a vein. The drug collects more in cancer cells than in normal cells. 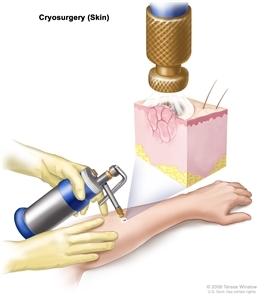 For skin cancer, laser light is shined onto the skin and the drug becomes active and kills the cancer cells. Photodynamic therapy causes little damage to healthy tissue. Interferon and imiquimod are biologic agents used to treat skin cancer. Interferon (by injection) may be used to treat squamous cell carcinoma of the skin. Topical imiquimod therapy (a cream applied to the skin) may be used to treat some small basal cell carcinomas. Targeted therapy with a signal transduction inhibitor. Check the list of NCI-supported cancer clinical trials that are now accepting patients with basal cell carcinoma of the skin. For more specific results, refine the search by using other search features, such as the location of the trial, the type of treatment, or the name of the drug. Talk with your doctor about clinical trials that may be right for you. General information about clinical trials is available from the NCI website. Retinoid therapy and biologic therapy with interferon. Check the list of NCI-supported cancer clinical trials that are now accepting patients with squamous cell carcinoma of the skin. For more specific results, refine the search by using other search features, such as the location of the trial, the type of treatment, or the name of the drug. Talk with your doctor about clinical trials that may be right for you. General information about clinical trials is available from the NCI website. Check the list of NCI-supported cancer clinical trials that are now accepting patients with actinic keratosis. For more specific results, refine the search by using other search features, such as the location of the trial, the type of treatment, or the name of the drug. Talk with your doctor about clinical trials that may be right for you. General information about clinical trials is available from the NCI website.